I am staying away from the television and newspapers today. Everyone else seems glued to the news of another shooting on another college campus. But I prefer not to hear one more thing about violence in a school setting. I am a Teacher. In one more month I will be marking the 30th year since I graduated with a degree in Elementary Education from Oklahoma Christian College and began my teaching career. Those thirty years have seen a drastic change in Education. Curriculums have changed. Textbooks have changed. Testing measures have changed. Classroom designs have changed. Playgrounds have changed. School lunches have changed. Public attitudes have definitely changed. Along with correct drinking fountain skills, jump rope rhymes, learning to get along with others, planting seeds in paper cups and an ever broadening spectrum of formal academic skills, I am now required to have my Kindergarten class participate in ‘lock down drills’ as well as tornado and fire drills. We must teach anti-bullying lessons in our classrooms. Parents need to report to the office for a ‘visitor’ sticker before coming to a classroom to help. Birthday treats need to be scanned for peanut/chocolate/lactose and gluten allergies. Our office staff will soon need medical degrees for all of the medications they dispense during the day. And we need to ease worries about gun toting citizens storming into schools. Did we really worry about that 30 years ago? I wonder if I would have proceeded down the path of a teaching career had someone given me a look into a crystal ball. Probably. You see, one thing has not changed in 30 years. The mind of the child. The mind that yearns for stimulation and fun. The mind that very literally soaks up the information that is tossed their way, processes it and then tosses it back out into the world with their own stamp of approval. The mind that looks for a reason behind everything and tries to make it fit in the world they know. Childhood has certainly changed…just as education has. Our children have seen the very news reports and written pieces that I am avoiding today. Even five year olds know about war in far away places. They know about food kitchens and children who do not have socks to wear and blankets to wrap up in. They know about allergies and illnesses that could take their friends away forever. Try as we might, we simply cannot keep them in their own little bubble of innocence any more. They will see….they will know….and ultimately they will change the world we are handing over to them. It is our job as Teachers…and Parents….to give them the tools for change. So….we will teach them to read and to write and to measure angles and sort things with common attributes. We will keep them safe with lock down drills…..and teach them to problem solve. We will guard them from peanuts and chocolate and lactose and gluten and bee stings and strangers……and teach them to take care of their bodies. We will toss worms back into the grass after a rainstorm and capture spiders in our classroom to be released to safety outside. We will teach them to guard the gifts of the earth. Guard them very carefully. We will keep singing songs about vowels and bubble gum and monkeys jumping on the bed….and teach them to laugh. We will encourage them to collect cans for food kitchens, blankets for shelters and pennies for the Leukemia Foundation. We will cheer as they jump for the American Heart Association. We will keep the world of gun men and wars and hunger and sick at bay for a while every day…….and give children the innate self esteem to know that they have the power to change things. We are Teachers after all….and that is what we do. Every single day in this crazy world. We teach. When I was eight years old, my parents left my sister and I with Aunt Cleo to spend a week in New York. They were participating in a reunion of my dad’s WWII army division, the Golden Acorn 87th. When they came home my mom was full of tales of cab drivers that cursed one another, buildings so tall they blocked the sun from the streets, the Statue, the UN building, the World’s Fair, wonderful people, the hustle and bustle and exciting sights. My little head was fairly bursting and filled with a longing to see the city myself. I read everything I could about the city…every fictional kids’ book I could get my hands on that was set in old New York and new New York. Anyone ever read ‘The Magic Tunnel’? I think mine was tattered to shreds. As I grew, so did my desire. When I became enamored with play writing and theater as a pre-teenager, it blossomed even more. The fact that Broadway, Off Broadway and Off Off Broadway were in NYC made it even more enticing. Only a short plane hop away, right? But, always, always ‘life’ stepped in to divert time…and money…. elsewhere. My children have learned to love Chicago, as it is a city closer to us. It’s their ultimate vacation spot. 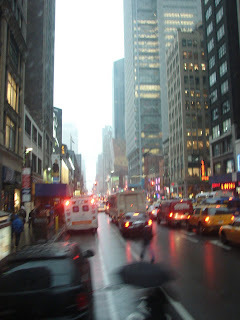 My husband rankles at the thought of crowded streets and traffic jams. But my heart still longs for the streets of New York…..just once. Last week my younger sister , who – ironically – has never wanted to visit there, came home from chaperoning her daughter’s high school band trip…to New York. Heh. Pay backs for her childhood ‘enlightenment’ to the existence of Santa and the Easter Bunny, no doubt. She came home with tales of crowded streets, hustle and bustle, flowers in street stands, buildings so tall they blocked the sun from the sidewalks, tributes to the life changing 9/11, astounding architecture, testy food, tour guides with sass and memories of a life time. Sigh. And so the pictures are hers….and readily shared with me. But there is still hope for my ultimate vacation after all. My daughter’s scout troop is contemplating next year’s end of the year event as a ‘weekend in New York’. Loose in New York with a gaggle of 12 year olds? I will be SO there as a prospective chaperone. Till then….and I know it’s trite but…..give my regards to Broadway! Update….The troop decided that a weekend in Chicago was the way to go. Still had a great time though. I think that I am a TOTAL city bird! April Fool’s Day passed in a relatively quiet manner this year. It was Sunday and the kids were roused with a ‘we’re late for school!’ call. Not funny as they stumbled out of their beds….for about 30 seconds. Then there was the telephone call to Non and Pop in Florida. Snow storm in Michigan and the kids were out playing in it. Foot and a half of snow was dumped over night…easy. Naw, they said. Bantering back and forth for about 10 minutes as the sun flooded in the bedroom window and the kids were stuffing blankets in their mouth to keep from laughing. Finally, just as we were to hang up and I had Non hooked…line and sinker…I said ‘April Fool’s’. It was a funny, funny scenario in my kids’ eyes. One we tried to copy later with Aunt Darcy…but lost it in giggles too soon. Oh well. This ‘holiday’ has never been one that I took particular delight in. I don’t like being the fool. And unfortunately, being a too trusting and somewhat naive individual, I was usually…the fool. It is a day however, that never passes without thoughts of pink elephants. When I was growing up, our telephone would ring on April Fool’s Day and it would be my Grandmother. “Quick…run to the back door,” she would say. “There are pink elephants flying over your house!” And I would do it. Every time. There was a year or two when I would argue and she would insist and I would always check. And then there was the year (I was in college, I think…) when I called her to tell HER to run to the window to see the pink elephants. The tradition continues. My Grandmother died last summer. 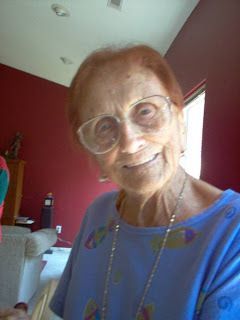 She was 97 years old and still living on her own in a nice little house in Florida. She lived for long drives in the car, flea markets and meals eaten at restaurants with the best senior citizen discount. She was fortunate to have her children – a tremendous support system – around her to help her sustain that life style. They drove her here and there, ate with her in restaurants and looked after her daily needs. Even in the end, she was lucky. We were all there. Admirable. Ninety seven years old and taken out by a careless driver in a head on collision. She hung on for several days….surrounded by her children, grandchildren and four of her great-grandchildren. Lucky her…..
My Grandmother and I had a complex kind of relationship. I was never an easy child. Big for my age, cloddy, loud, occasionally obnoxious (okay…maybe more than occasionally), heavy, hearing impaired and introspective, I had been born smack in the middle of my Grandmother’s ‘favorites’. One was a cousin two and a half years older that she helped raise and the other was my sister, four and a half years younger. Her computer screen name isn’t ‘litte ray of sunshine’ for nothing. It is a childhood nickname that stuck. Sigh. I never, ever felt like I quite measured up in my Grandmother’s estimation. She was a stern task master and demanding individual. When I spent the night at her house I puked on the inside of her brand new van. When I went shopping with her we would always buy my clothes in the fat lady section….no matter how much I argued. I broke a glass figurine that was displayed on her glass table. I consistently fought being seated at a ‘kids’ table’… especialy when the afore mentioned cousin made the move to the ‘big table’. I was always too loud…or too boisterous…or too…whatever. Hungry for attention from someone that didn’t have it just for me. So I thought…as I grew up. Oh, I have great memories because of her as well. My family camped on weekends with my grandparents as I was growing up. We spent many holidays at a special restaurant in Frankenmuth with them….and when we celebrated at home her cole slaw was the best tasting ever. And I never got her recipe. There were birthday cakes with quarters wrapped in plastic and stuffed inside the birthday kid’s piece. There were chins dripping with peach juice from the fruit grown in her backyard. There was money that turned up in surprising amounts in surprising places. She took my sister and I to Hawaii the Christmas after my Grandfather had died. An unbelievable and treasured time. I will never forget the look on her face when we hung a filled stocking for her to find on Christmas morning that year…in the hotel shower. We continued that tradition for her for a couple of years after. I was in my 20’s when my Grandfather died. He was the third of her four husbands, the Grandpa we had grown up with and her undeniable soul mate. It was a difficult, difficult time for her. For all of us. As we were filing into a pew for his funeral service, my Grandmother unexpectedly slipped between my sister and I to sit. That was the first – and only – time in my life when I ever felt like I was able to please her. We held her hands that day. I prayed…long and hard and passionately that she would find peace. That day passed and we moved on with our lives. She moved many states away to Florida. We didn’t see much of one another. She loved the fact, however, that I loved to write. It was probably the one thing we had in common…aside from our prickly personalities. A traveler with good memories of trips to China and Korea, she delighted in the fact that my children are Asian. We forged a relationship of respect….but never one of real friendship. That relationship belonged to the ‘little ray of sunshine’. Heh. I am fortunate that I have gotten to know my Grandmother better through my sister and her sharing. And I am fortunate to have been there in the end. My children have several days worth of memories with ‘the freaking OLD people’ as my Grandmother and her entourage babysat for me while my mother was in the hospital last summer. Those will be memories that stick with them for a long time. Kind of like pink elephants flying over your house.